Soon, three of my favorite guys will be leaving on a plant exploration trip to China. In the tradition of famous plant hunters like E. H. Wilson and George Forrest, Dan Hinkley (founder of the former Heronswood Nursery in the state of Washington and a frequent guest on Martha Stewart's TV shows), Ozzie Johnson (plant collector who has an Atlanta-based propagation business) and Scott McMahan (owner of two nurseries in Atlanta and Clermont, Ga.) have traveled to remote areas around the world, risking life and limb to discover ornamental plants to share with gardeners everywhere. The three have had some hair-raising adventures, worthy of a Survivor show. They've encountered hideous land leeches, poisonous vipers (Dan was saved by a guide at the last minute when he reached for a tree to hoist himself up; a snake was coiled around a branch, and the guide pulled Dan's hand back just in time) and all sorts of other dangers. On one trip, Ozzie slipped on a narrow trail and impaled his bicep on a broken piece of bamboo (he was extremely lucky not to have lost his arm). On the last trip, a boulder fell onto Scott, pinning him down and injuring his foot. In recent years, the three have been to Vietnam several times, exploring the high mountains near the border of China. They've made some great discoveries that are now being tested for garden worthiness. 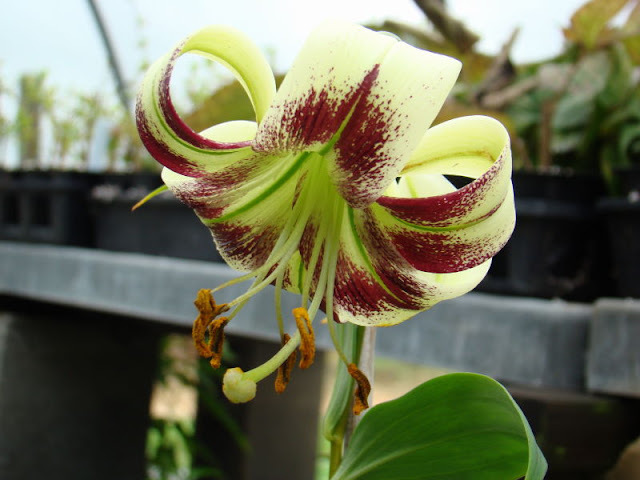 The lily you see above, Lilium poilanei, is one of a handful of the genus native to Vietnam. I was disappointed to learn it is difficult to grow, but Scott has sent bulbs to a hybridizer to see if the flower can be crossed with hardier stock. I'm keeping my fingers crossed. It takes years to ascertain whether a plant is reliable, i.e., if it will hold its color, if it is invasive, etc. I'm already looking forward to the future, when we may be able to grow hydrangeas that produce clusters of berries, ferns with fronds six feet long, and flowers like the gorgeous lily pictured above.